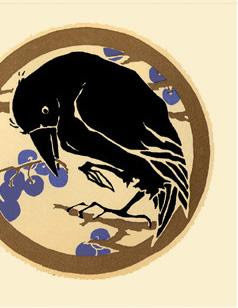 This print is "Circle Raven" by Yoshiko Yamamoto— one of many beautiful letterpress designs from the Arts and Crafts Press. The card got Dad and D. and me talking about ravens and crows and their ilk. My father has always had a curious mind, to say the least, but these days there's more curiosity than retention, more silence than response—you often have to simply trust that he's taking information in and let go of expectations about to what use his mind may be putting it. I had recently bought him a large-print book of poems because his eyesight is bad and he's so bored and he used to be someone who cared about poetry. I don't think he's read much of the book, so given what we were talking about, I decided to read Edgar Allen Poe's "The Raven" aloud to him. As I read, Dad leaned forward, appearing to listen intently. Every time I got to the refrain "Nevermore," which ends the last four stanzas, he looked up and joined in with heart—"Nevermore! "—finding, it seemed, a place of memory within him still. A place where a single familiar, archaic word was stored from adolescence, or childhood, or even deeper back, a place where words themselves originate, where he would have found me at that moment as well.